Happy Friday everyone! And happy end of July! This month, my goal was to work on my nail art skills, and I’ve really tried to branch out with new tools and techniques. I upgraded my stamping game with the purchase of some new sets from Bundle Monster and the Creative Shop squishy stamper (hey, sometimes you just need/want more options). Plus, I tried out gradients for the first time (with varying results). 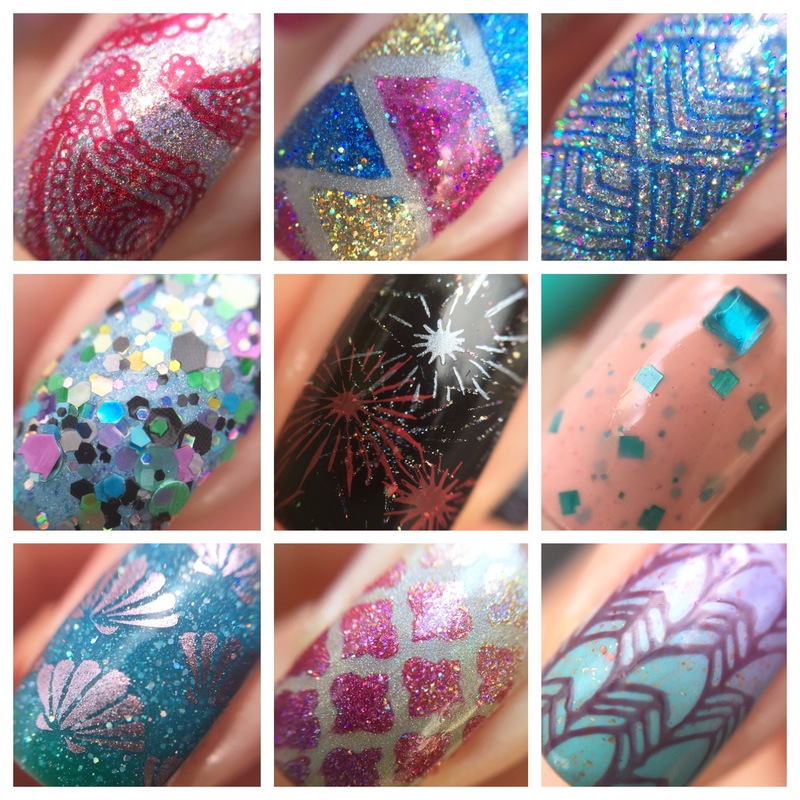 Down at the end of this post, I’ll recap my favorite accent nails of this month. For the last day of Nail Art July, of course I have to do some nail art! For this mani, I used GlitterDaze “Three’s A Charm,” a mega sparkly dark pink-purple that is equal parts metallic and holo. 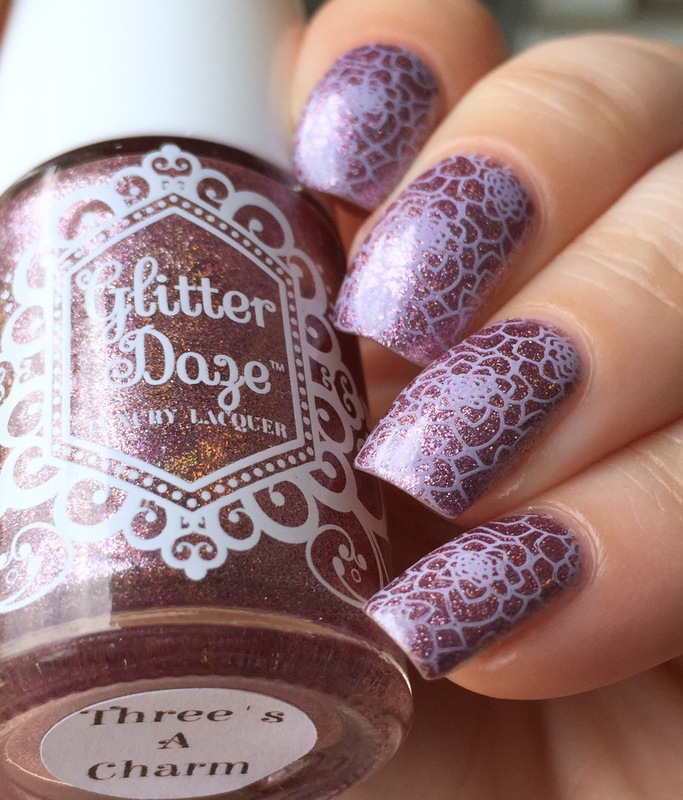 “Three’s a Charm” achieves its unique look from a combo of silver foil flakes and tons of multicolored shimmer. The formula is excellent and this is full coverage at two thin coats. The first three photos are in the shade, where the metallic side of the finish stands out. I’m not normally an enormous fan of metallics, but this had all of the bonuses without any of the drawbacks (brushstrokes, emphasizing imperfections in the nail, etc.) and I really liked how it looked and wore. The second three photos are in the (meager) sun. Honestly, the photos just don’t do justice to how much the holo pops in the sunlight. The color looks a bit darker in the sun, but it’s just so sparkly! I stamped over “Three’s A Charm” using Bundle Monster white stamping polish and Bundle Monster’s BM-XL07 stamping plate. I had fun doing florals for the first time! 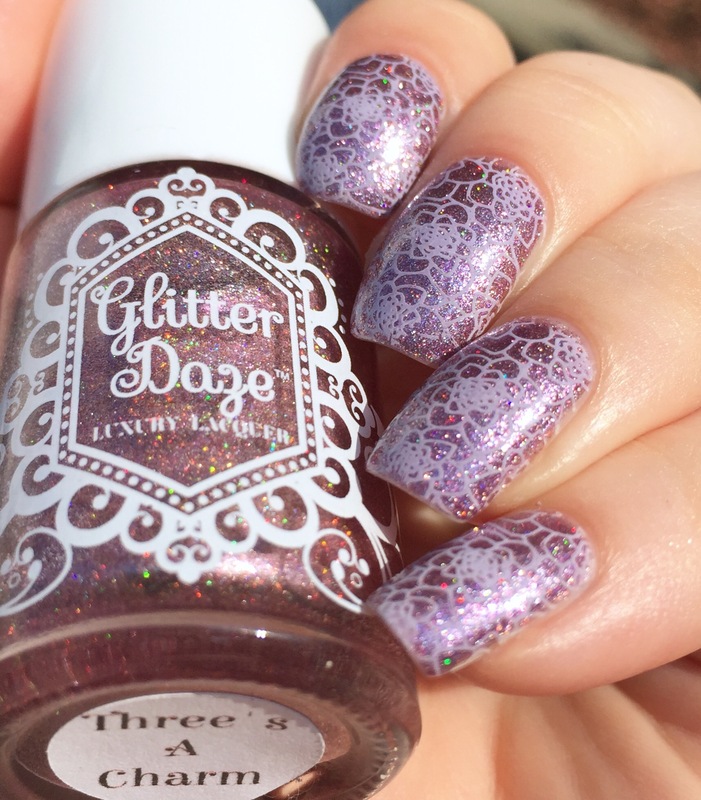 “Three’s A Charm” is an LE for GlitterDaze’s third anniversary this year, but luckily it’s still in stock on their website! What is my #1 favorite from this crazy month of trying new things? 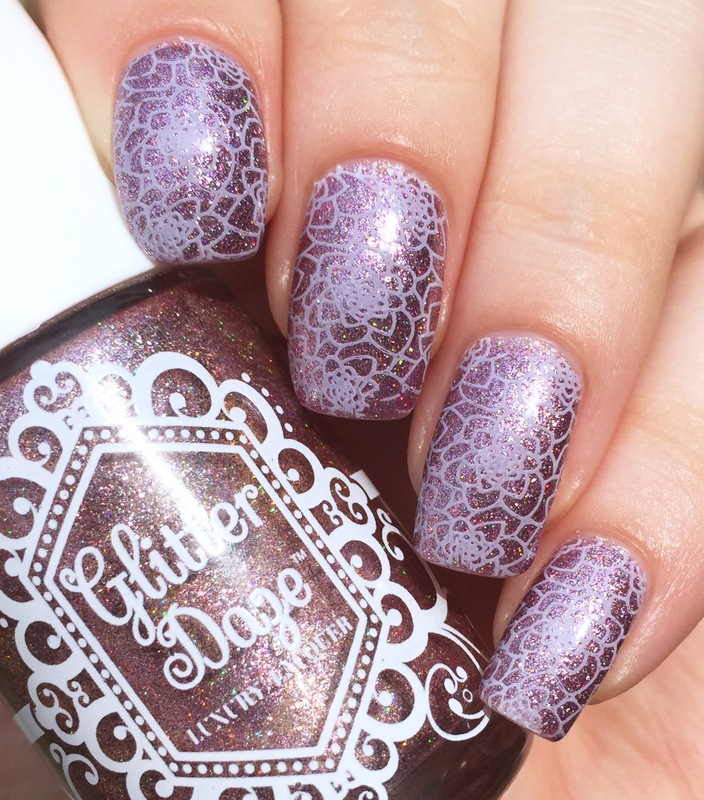 I would have to go with the warm holo gradient over quatrefoil vinyls- it felt like the most visual reward for my effort. What is your favorite? I love stamping + glitter. I love the stamping you did! Metallic polish under stamping is my favourite way to stamp! Oooh what a pretty polish! 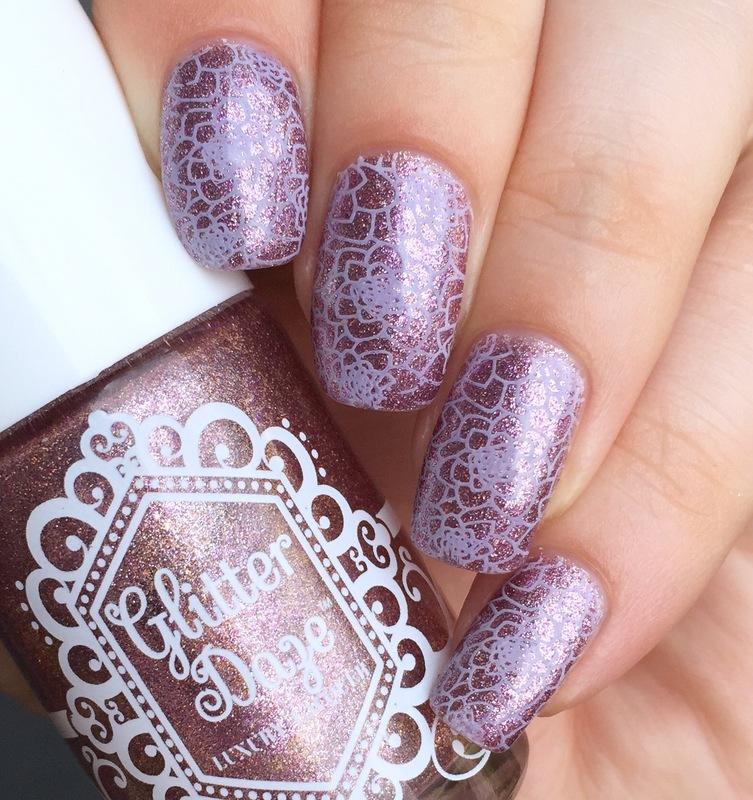 And you’ve definitely stepped up your nail art game! Thank you! I’m still working on it! Those macros are spectacular! What a gorgeous polish. I dont think I can pick a favorite. They are all so beautiful in different ways.